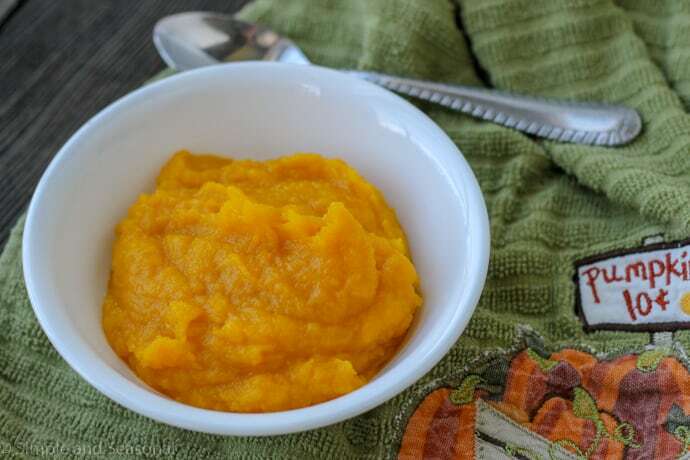 Ditch the can and make your own Crockpot Express pumpkin puree for fall baking! I have a confession. I’ve never cooked a pumpkin before. In my mind, pumpkin comes from a can. *gasp* 🙂 It just always seemed like so much work and not worth the extra time. However, with Crockpot Express Pumpkin Puree, it’s not only fast, but it’s easy. It’s REALLY easy. Like, don’t bother to peel it or pull out the seeds kind of easy. Within about 5 minutes of prep time, I had enough pumpkin for three different recipes! So why bother? Well, some people don’t like to eat anything from a can, preferring fresh fruits and vegetables. Others may be allergic to certain brands of canned pumpkin. 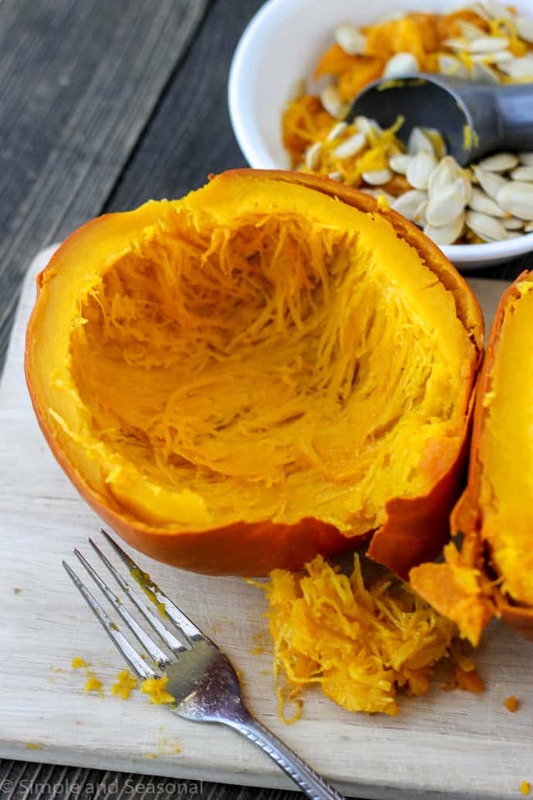 Did you know that a lot of canned pumpkin actually contains squash? I found this article on The Kitchn to be really interesting: What’s actually in your Canned Pumpkin? And then there are people like me, who just like to try new things. 🙂 Plus, it works out to be cheaper this way! Start with a 3 pound “pumpkin pie” or sugar pumpkin (not the Jack-0-lantern kind.) 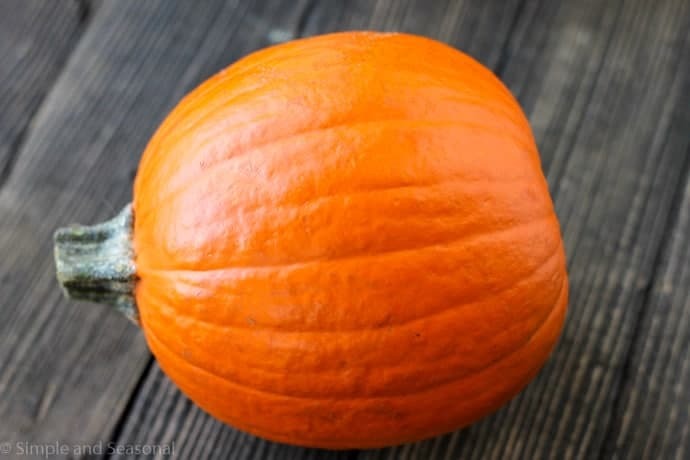 While the larger pumpkins are edible, they are extremely bland and watery. You can find baking pumpkins in the produce department of any grocery store. Be sure to find one that will fit inside your pot! If you have the new 8 Quart Crockpot Express, you’ll have even more room than I did. I have the original 6 Quart Crockpot Express. Don’t slice or peel it, but do remove the stem. Place the trivet in the pot, add 1 cup of water and then put the pumpkin on top of the trivet. My pumpkin was flirting with the “max fill” line, but since the whole pot wasn’t actually full, I knew it would be fine. There was plenty of clearance between the pumpkin and the lid. 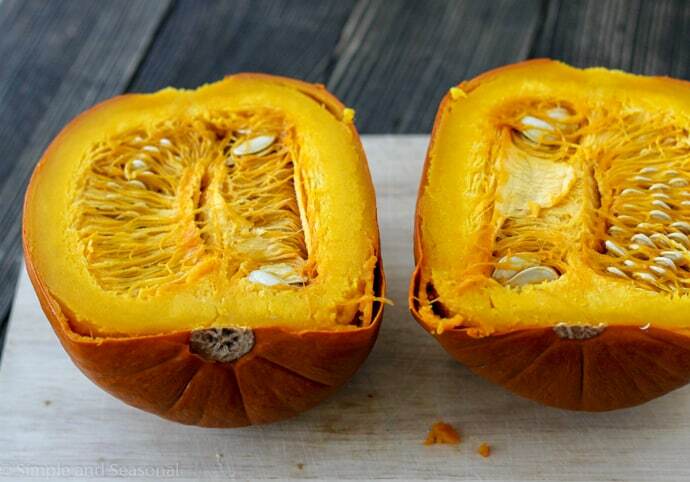 When the cooking cycle is finished, allow it to cool a bit and then slice the pumpkin in half. You can see where the flesh is pulling away from the peel already. Use a spoon or an ice cream scoop to remove the seeds and gently pull away the peeling from the outside. I used a fork to help pull away some of the strands around the seeds. My pumpkin was doing a very good impression of spaghetti squash at this point. 🙂 Pumpkin puree manufacturer Libby’s breeds their own Select Dickinson pumpkins for their extremely smooth texture. If you can get your hands on one of those, go for it! We saw some at the local pumpkin patch we visited, but I don’t know if they were available to the public. After you’ve removed all the flesh, toss it in a blender or food processor to puree it. I’m going to say right now, I should have just pulled out my food processor. It would have been faster in the long run. It’s such a pain to put together after digging out all the parts, so I just used my counter top blender. But I don’t have a fancy blender like a Vitamix, so it was a bit of a struggle for my little smoothie maker. You may have to add a little water to get it started, but you don’t want watery pumpkin, so be very careful! Only add 1 tsp at a time as needed. My efforts were rewarded with what looks like a bowl of baby food. 🙂 Ha! 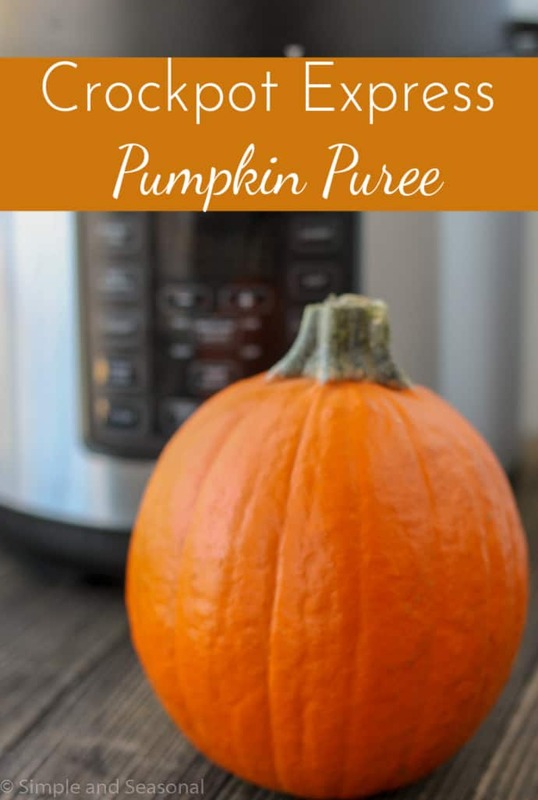 I got over 3 cups of Crockpot Express Pumpkin Puree out of this recipe. 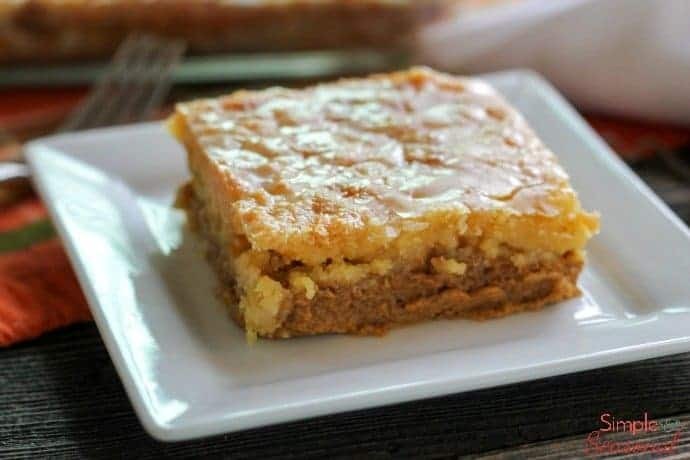 I used it to make my delicious Pumpkin Dump Cake, some healthy pumpkin pie dip and even a Crockpot Express Pumpkin Cheesecake! I’ll be sharing the recipe for that cheesecake in a couple days. 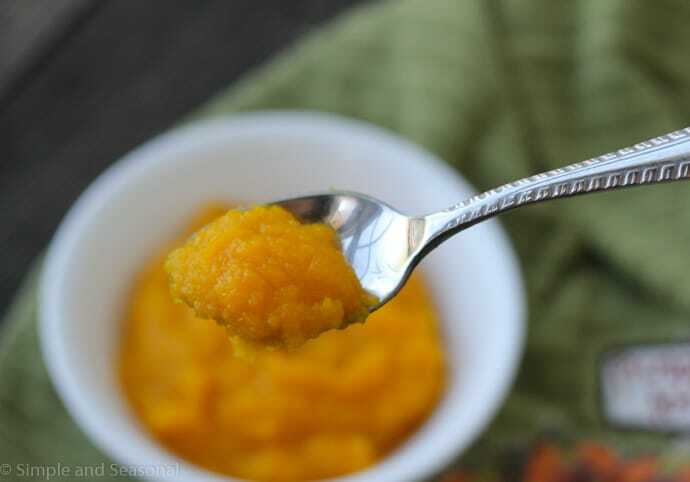 Ditch the can and make your own pumpkin puree for fall baking! 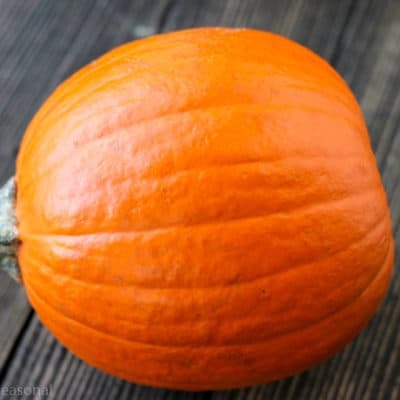 Remove the stem from the pumpkin. Place the trivet inside the cooking pot and add 1 cup of water. Place the pumpkin (whole) on top of the trivet. Close and lock the lid. Turn the Steam Release Valve to closed. Press Steam and set for 13 minutes. Press Start/Stop. 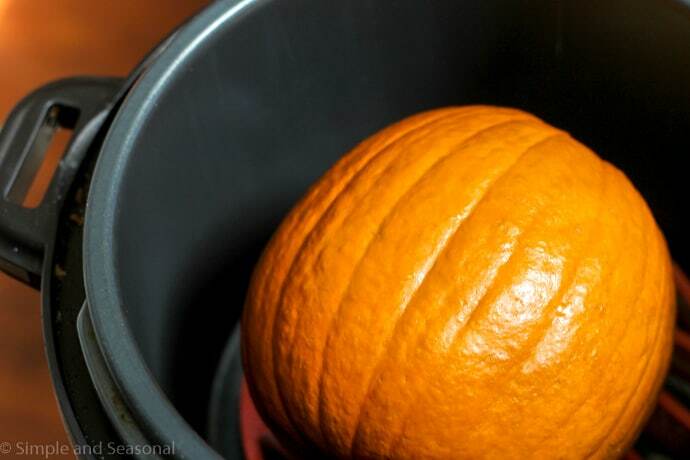 When the cooking cycle ends, allow the pressure to naturally release (about 10 minutes) and then open lid and gently remove pumpkin. Once pumpkin has cooled enough to touch, slice in half. Remove seeds and pulp with a spoon or fork. Pull the peel away with your fingers. It should come off quite easily. If there are any sections that are stuck, simply remove the peel with a paring knife or vegetable peeler. 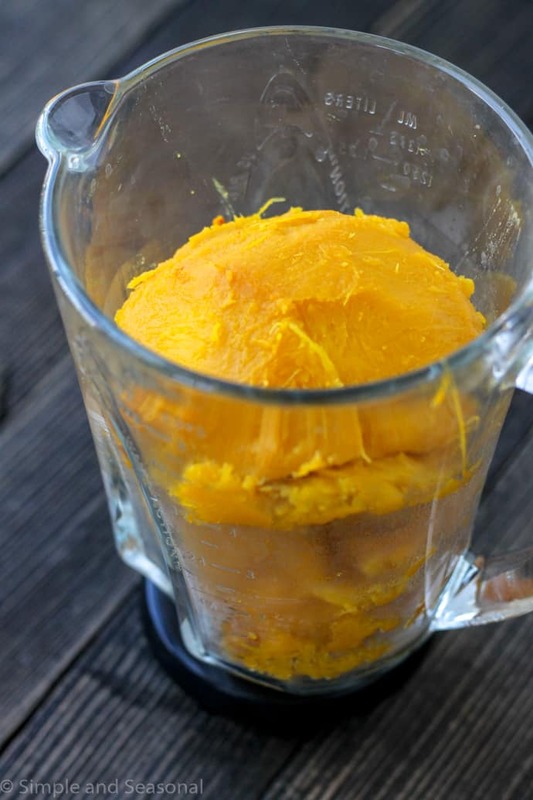 Place pumpkin flesh in a blender or food processor and blend until smooth. Add water only if necessary, one tsp at a time. Store in an airtight container in the refrigerator or freeze for future use! Oh, this is the ONLY way to make pumpkin puree! A huge thank you. Hardly any mess! Woo hoo! Double score. So no straining and squeezing the puree? That step is completely gone? Nope! I actually had to add a tbsp ovso of water to help my blender process the cooked pumpkin. There certainly was no excess liquid to have to strain or squeeze at all. It came out just like it was from a can of Libby’s 🙂 Now, I suppose it could be different with another type of pumpkin like a Cinderella, but the pie pumpkins that I used were all the same.